In order to help professors to rethink their learning education way and how they build it, the Teaching Methodology Office in partnership with FGV-EAES developed a methodologies catalog and new technologies tools, showing several possibilities, advantages and challenges in the use of these against traditional technology of the "black board and the chalk". 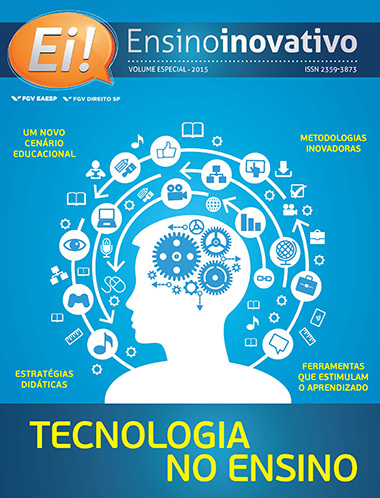 The strategic and technological catalog is available inside E! Innovative Learning Magazine’s digital special edition and brings several technological innovations that can be used by professors to enhance the students’ interactivity and class’ dynamism. In the methodology section, there are several themes that are addressed, as many as hybrid learning, inverted classroom, problems solving technique and design thinking. The technological tools section shows internet web pages and apps to develop the project and activities management, database, mental maps, storylling, comics, videos, remote dynamics and debates, digital games, books, digital notebooks, word clouds, infographics, timeline, formative evaluation tool, learning analysis and geo-referencing.